Make your kid’s birthday party extra special by hosting the event at one of Maine’s excellent kid-friendly venues. From discovery museums, to state parks, to anti-gravity fun zones, you’ll find something truly special for your little one in the Pine Tree State. Here are our 10 favorite spots to host a kid’s party in Maine! Maine Indoor Karting is the place to hold a birthday party that all ages will love for years to come. The facility offers a range of party packages that include everything such as racing, pizza, and the birthday cake. Children as young as three can enjoy having a party here. Trampoline parks are all the rage these days. What kid (or adult) doesn’t love bouncing high and perfecting their backflip? The Orono Trampoline Park is a 40,000-square-foot facility with heaps of trampolines, a foam pit, and an arcade. Check out their party package that include a one-hour jump pass, pizza, and ice cream. Just bring your own cake! The Children’s Museum & Theatre of Maine is both loads of fun and educational. The museum has several floors of exhibits, like the newly revitalized farmers market. Kids will love playing on the fire truck, lobster boat, and space ship. The Children’s Museum & Theatre of Maine offers two different party packages making it to play your child’s birthday bash. The Maine Discovery Museum in Bangor is Maine’s largest children’s museum. The museum is home to heaps of interactive exhibits, like Amazing Animals, Booktown, and Dino Dig among many others. The facility offers three different birthday party packages with various inclusion. Additionally, you can add on fun activities like Spin Art or Wearable Treasures. Seacoast Adventure in Windham is the perfect place to host a summer or winter birthday. During the winter months, you can enjoy a day of snow tubing in their Snow Park. For the summer birthdays, you can play mini golf, splash in their new water park, or ride go karts. Or you can fly high with their Crazy Apes Adventure Park. The kids will sleep good after a day of fun here. Spare Time in Portland is home to lots of fun, especially for the children over 12 years of age. There is plenty of bowling, arcade and video games, and laser tag. 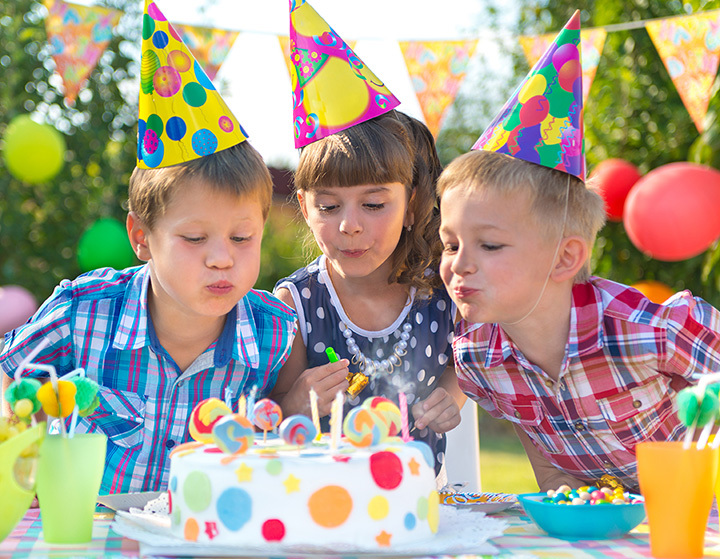 Birthday party packages are both customizable and affordable. Adventurous kids will love the Anti-Gravity Complex at Sugarloaf. Smaller groups can enjoy private rentals of the trampolines and climbing wall with instructors. The Anti-Gravity Complex is also perfect for kids who love to skateboard. Afterwards, take those hungry kids down Food Truck Alley for a bit to eat. Joker’s Family Fun & Games in Westbrook has been the place to go for children’s birthday parties for years in southern Maine. Enjoy hours of play in the “Amazing Playhouse,” their delicious homemade pizza, and tons of video and arcade games. Choose from their basic or premier birthday party options. Children with summer birthdays will love spending the day at the beach. The park is 100-acres big with tons of nature trails and miles of white sand beaches. There are plenty of group picnic shelters and tables where you can enjoy a good old barbecue and cake. Playland Adventures in Brewer offers fun adventures for everything from toddlers to adults. The large indoor facility has inflatables, bungee trampolines, a Gyrosphere, arcade, and even a mechanical bull. During the summer months, you can enjoy their outdoor splash zone and stay cool. Admission is extremely affordable.